Blonde Redhead are an American joint, maybe say, the Cocteau Twins of our generation. The band is a trio featuring the (twin) Pace brothers, and guitarist/vocalist Kazu Makino. The band initially caught the eye of Sonic Youth drummer Steve Shelley, who ended up producing their debut in 1995. Some of their early work is comparable to Sonic Youth, but over the course of their discog they've def marked out their own unique sound; Makino is known for her high and eerie voice floating around the music, sometimes accompanied by Amadeo Pace, which stands at the forefront of their uplifting yet melancholy sound. 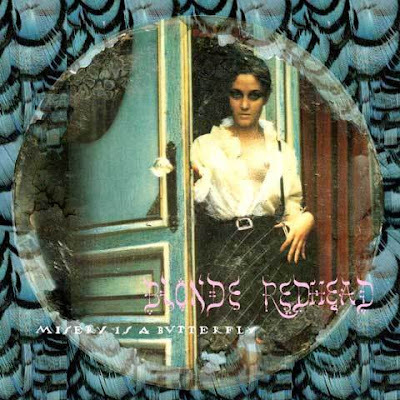 My favorite Blonde Redhead album is their 2004 release, 'Misery Is A Butterfly'. The album's release ended a four-year gap in the band's inactivity -- of which Kazu Makino spent much of the time recovering from injury after being trampled by a horse (daaag). Many of the lyrics reflect this event/recovery, which I think made for Blonde Redhead's most emotive release. I'd say you can go about anywhere from here, but in my opinion 'Misery Is A Butterfly' is the pinnacle of Blonde Redhead...and for the unfamiliar, the ultimate introduction.